Recently I was visiting Portland, OR with my family and found myself at Powell’s World of Books (If you’ve never been, please get there – the place is AMAZING). 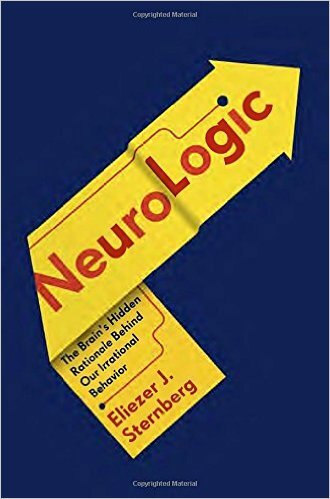 I ended up with a little stack of books related to my field, and really enjoyed NeuroLogic: The Brain’s Hidden Rationale Behind Our Irrational Behavior by Eliezer Sturmberg. Dr. Sturmberg is a neurologist and has created a compelling and easily digestible book relating how our brain regions contain the secrets of our behavior. His ideas are thought-provoking and delve into the world of people who have full cognition even while challenged by brain dysfunctions (like being blind and not realizing it – fascinating stuff). He uses science to support ideas that we have long suspected about the brain, making a clear neurological case for the power of hypnosis that comes closer to what practicing hypnotists have learned experientially. In fact it was refreshing to have a medical doctor support hypnotic trance rather than dismiss it. I found myself synthesizing the knowledge in his book with the practice of Neuro-Linguistics as a way to put what he is saying to work with clients. If you’ve ever been curious about why we act in certain ways, Neurologic takes us on a tour of the brain’s many regions – explaining how habits and going on “auto-pilot” while driving actually take place in a very different region of our brain than when we are being overly conscious of our actions (like when learning a new skill, for example). The book is very accessible and well written – taking studies and medical research and transforming it into something that anyone can understand. Some books about brain functioning can be technical or off-putting; Neurologic finds ways to show examples of people with brain damage that is compassionate and illustrative, showing how malfunctioning or deprived parts of the brain account for many types of behavior that we might otherwise attribute to “emotional damage” when in fact the underlying issues are physical in nature. The books I read and review inform my coaching practice. If you are someone who is ready to make a life change, coaching could be for you. Find out more about Timothy Thomas Coaching and contact me for a free, no-obligation phone conversation to discover if there are things in your life that you’d like to change.